The Oregon Ducks were the talk of the nation last week when it was announced that they were going to don hot pink helmets for their PAC-12 game against the Washington State Cougars. National news, talk shows and watercoolers everywhere were buzzing about football players actually wearing – wait for it – PINK. How could the U of O do such a girly thing to such a manly sport the sports nation troglydites retorted. These dullards dialed in their discontent to both the national and local radio shows for the university ‘forcing’ their players to wear pink. The choice wasn’t to humiliate the players. The choice wasn’t a new fashion trend. Were the players forced to wear pink just for marketing shock and awe factor? Nope. The choice, to wear pink or the white stormtrooper helmets, is one the players always decide. Going to the Univeristy of Nike has many perks, getting to select which helmet to wear is just one of them. The genius behind wearing pink helmets and socks was two-fold. First it got the entire country talking about the Oregon Ducks – brand awareness – allowing those back east to realize Oregon is north of California and south of Seattle. Even Dan Patrick’s much maligned Dannette, Fritzy (executive producer Todd Fritz), may learn how to pronounce Oregon (Orygun) by season’s end. Increasing brand awareness for the Oregon Duck football program helps with recruiting, donations and enrollment. The second genius part of the pink helmets is that the Oregon Ducks endear themselves to all moms of future U of O recruits. 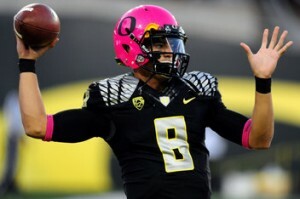 When trying to decide where to let Johnny football sign, moms will be more familiar with the Oregon Ducks because of their national recognition and maybe remember that the little university from Oregon wore pink helmets to contribute to a cause greater than their own. How bad could a university be that promotes breast cancer awareness? Going pink was the right choice. Perhaps the rest of college football can steal a play from Oregon’s playbook, not in executing the read option, but in caring about something besides themselves. By choosing to support a cause important to moms and women everywhere, the University of Oregon made a choice to make a difference off the football field. Anvil Media’s expertise in the PPC and SEO industry is unparalleled.